Drew Bowling began writing stories in elementary school. Mostly he wrote mysteries, westerns, and scary tales about courageous kids who were good at finding trouble. While in high school, Drew continued to write mysteries (in chemistry), westerns (in biology), and scary tales (in algebra). His family encouraged him, and his friends even voted him ‘The Next Billy Shakespeare’ during a mock award ceremony at the end of his senior year. Other people told him that making things up was a waste of time. In response, he started writing his first novel, The Tower of Shadows, during a senior-year math exam. Drew Bowling’s hobbies include snowboarding, defending the literary merits of dragons at parties, reading anything and everything. He lives in Maryland. Read an excerpt of The Tower of Shadows at Drew Bowling’s website. Last time I read a much-hyped fantasy debut by a promising up-and-coming talent it was the highly disappointing and, at least to me, overrated Eragon by teenager Christopher Paolini. 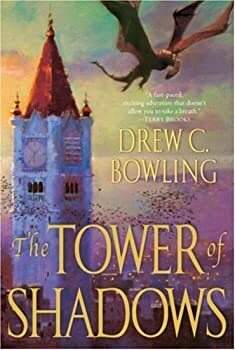 So, even though it came with much less fanfare, I was admittedly skeptical about trying out The Tower of Shadows, another fantasy debut by a young wunderkind. Fortunately college student Drew C. Bowling, who started his novel in high school, is a much more accomplished writer than Paolini was, and delivers an impressive first offering.